As requested by a friend, I made these brownies for our gathering yesterday.I seldom made brownies as their calories content are pretty high and I am afraid I ll consume many of them after baking. I am a big fan of brownies and it's hard for me stop once I started the first bite LOL.My brownies were well received and my dear friend ,BB, really enjoyed them. Brownies is her favorite as well. 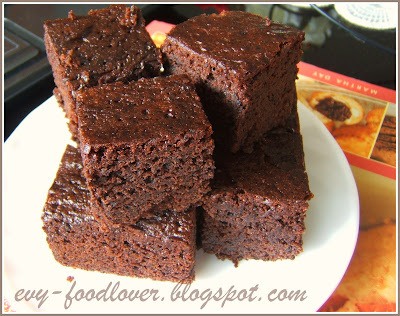 For this time, I used HHB's Brownies recipe but did minor modifications to the recipe. Melt butter and chocolate in a stainless steel bowl (placed over a sauce pan of simmering water). Using an electric mixer, beat the egg ,sugar and vanilla extract until it reaches to ribbon like stage. 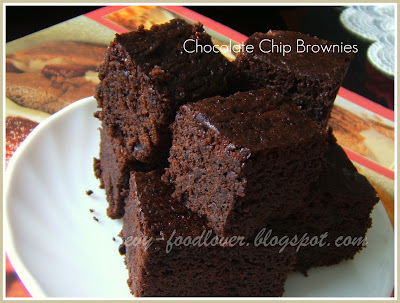 Pour in the butter-choco mixture and mix well using spatula. Fold in the flour/cocoa powder gently. Pour the batter into 8"x8" baking tin (greased and lined with parchment paper) and sprinkle some choco-chip on top .Bake for about 30mins in 180 degree preheated oven. Cool it completely in the tray. Cut it into your preference size and ready to serve. Enjoy!